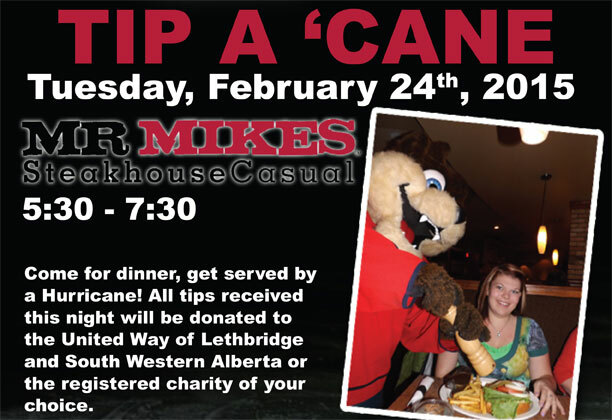 On Tuesday, February 24, players from the Lethbridge Hurricanes hockey team will be serving up drinks, appies and dinner at Mr. Mike’s Steakhouse Casual for another round of “Tip a ‘Cane”! All tips earned that evening will be donated to United Way of Lethbridge & South Western Alberta to invest in programs that make day-to-day life better for people in the community. Diners will even have some choice as to where their support is directed. Patrons are free to choose to pledge their support to the Community Fund which is divided between a number of organizations annually or send their donation to any of United Way’s current partner agencies. Don’t miss out on the fun and the opportunity to support your community at Mr. Mike’s Steakhouse Casual!